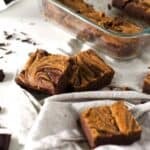 A gluten free, paleo, extra fudgy brownie topped with an almond butter swirl. Once melted, remove from heat, add the coconut sugar and whisk to combine. Add eggs and vanilla and whisk once more until combined. Add almond flour, arrowroot powder, and salt and stir until combined. You'll have a thick, fudgy batter. In a separate small bowl, combine the almond butter, honey, vanilla and salt and stir well. Spoon the almond butter mixture in random dollops on top of the brownie batter. Take a table knife and stand it up vertically in the pan, touching the tip of it to the bottom. Keeping the knife vertical, begin to move the knife around the pan, swirling the almond butter mixture in. When you're happy with the swirls, lift the knife straight out. Bake in the preheated oven for 25 minutes, then allow to cool before cutting.